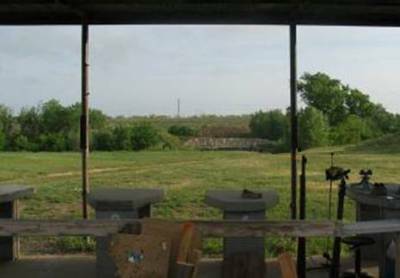 The Benchrest Range has target lines at 25, 50, 100, and 200 yards. There are ten concrete benches on the firing line covered by a metal awning. Stools, target frames, targets, sandbags, and front rests are provided and stored in the green shipping container immediately adjacent to the firing line. All shooting on this range must be done while seated at one of the benches. All Club and Range rules apply.